Pokhara—Myagdi District Headquarter Benibazaar and Galeshwor region are at high risk as flooded Kali Gandaki River and Raghu Ganga River eroded the embankment of those rivers last evening. The Raghu Ganga River flooded as Kuine Mangale area of Raghu Ganga Rurual Municipality-8 near Dhaulagiri Base Camp saw heavy rainfall and landslides. The river meets Kali Gandaki River near Galeshowr. 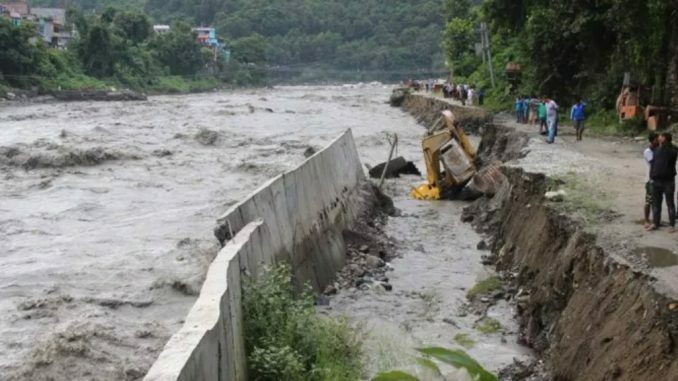 According to Myagdi Chief District Officer Liladhar Adhikari, the swollen Kali Gandaki River swept away cemented embankment and threatened Beni Bazaar. Similarly, Raghu Ganga River degraded it both sides near Galeshwor area. A bridge above this river that is a part of Beni Jomsom road is also in the verge of collapse. Likewise, the flood also disrupted the vehicular movement in Parbat Beni- Bagarphant road. Ritung Secondary school’s two building also became the victim of that flood. But no human casualty has been reported.